The biggest fireball I have ever catched on camera, and probably ever will. This was a great photographic moment for me! 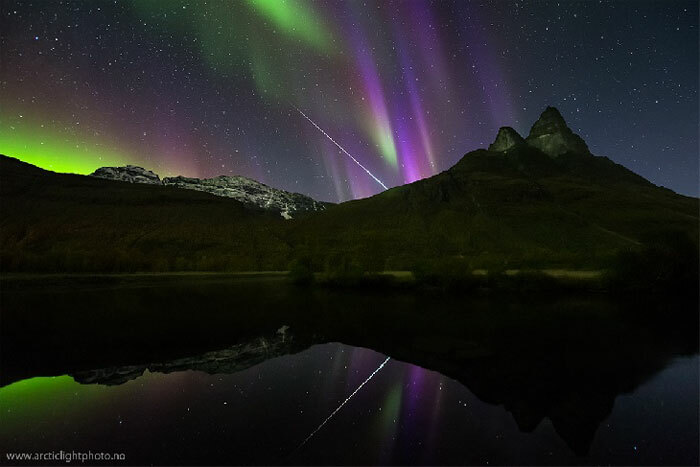 This shot was taken tonigh sept20th, an evening wich was full of awesome auroras in magnifcent shapes and colors. This shot was far from the one with the most auroras in from tonight, still a magnificent fireaball, reflected, above my favorite mountain Otertinden, a 90min drive from Tromsø, northern Norway, deserves to go out first. Awesome autumnal colors in the forest and a completely silent river in front. The fireball lasted for about 6-7seconds until it vanished behind the mountain, by the way this mountain is over 1200meters high, so do not be fooled by the 14mm wide angle lens! There was some very distinguished blue colors surrounding the fireballs edges. Never ever seen anything big like this!